Welcome To The Stonehill Cottages Blog! "Oh Spring, Spring! Wherefore art thou Spring?" The post “Oh Spring, Spring! Wherefore art thou Spring?” appeared first on Stonehill Cottages. Growing up in the Ouachita Mountains I wasn’t mindfully aware of the extraordinary gift I had been given – the gift of having immediate and direct access to the pristine Ouachita Mountains to enjoy as I pleased. When I became old enough to explore the wooded mountains by myself, I began doing so every chance I got – especially during the Fall season. Upon the arrival of the Fall season, I would roam the forest endlessly. I would routinely sit at the base of a random tree and breathe in the cool, dry and crisp air of the Autumn season – I would watch as the brilliant yellow sweet gum tree leaves slowly fell to the ground driven by the gentle motivation of the Autumn breeze. The Black Gum’s red foliage and the pure yellow of the hickory tree leaves in the Fall added a subtle but necessary color to Mother Nature’s palette of perfectly imperfect colors. The vibrant red/orange hues of the various red maple trees varieties that grow in the Ouachitas were my favorite. I loved and I still love Fall in the Ouachita Mountains. It has always been the season to which I am most drawn. It is no wonder that each year thousands of travelers reserve a cabin with a view of the Ouachita Mountains in hopes to catch the peak of the Fall foliage season in all it’s breathtaking glory. Each year at Stonehill Cottages we anxiously anticipate the splendor of the oncoming colors of Fall. 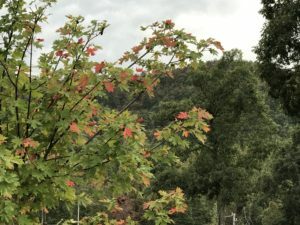 Color begins to appear as early as around the third week in September. The color in our immediate local area begins with the red in color black gum leaves. Color in general is visible sometimes as late as the third week in November depending on the year. The most common question we get here at Stonehill Cottages is “when is the Fall peak?” People ask this question as they are trying to determine when to book their vacation rental cabin so as to maximize their Fall color experience. The entire month of October is graced with Fall color of varying degrees. A reservation in October will assure you of some visible color. Although, the answer to the million dollar question “when is the Fall color peak” is that the peak generally occurs as early as last week in October or as late as the second weekend in November. We are already taking reservations for the Fall 2018 season. Book your mountain retreat getaway cabin now to be assured of your preferred dates!!! 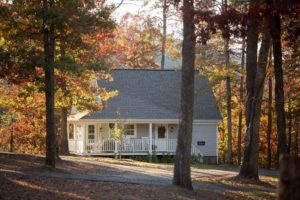 The post Fall Foliage In The Ouachita Mountains appeared first on Stonehill Cottages. Fall Foliage in the Ouachita Mountains is in full swing. The days ahead are likely the peak. You owe yourself a visit to Talimena Scenic Drive this time of year. If you’ve never done so before, why wait? Come visit Stonehill Cottages and enjoy the beautiful fall foliage season that is upon us!!! The post Welcome To Our First Ever Blog Post! appeared first on Stonehill Cottages.